Some Christian community leaders in Darjeeling have said they would write to chief minister Mamata Banerjee and ask her not to announce a purported board for hill minority communities without consulting them. Mamata, in a rally in Kalimpong on September 22, had said minority communities had approached her and sought the formation of a cultural board. She had said she planned to form such a board. Today, a meeting of several hill Christian leaders was held at the Divya Vani Pastoral Centre in Darjeeling where the supposed board formation was discussed. Bishop Stephen Lepcha of the Darjeeling Catholic diocese, who was present at the meeting along with 17 other representatives of the community, said after the meeting: "This has come as a very sudden decision and we were not prepared for it. This would also be a very important announcement. We need to discuss the issue among ourselves first." Jyotima Subba, the president of the All Christian Hill Minority Association, said the community members had learnt that the state government was forming a Pahari Minority Development Board and the board's announcement was to be made on November 27 in a Trinamul rally in Darjeeling. Subba, who is also a member of the Trinamul (hill) district committee, said: "According to our information, the board would include members from both Christian and Muslim communities." She said if a board is formed, "it should only be for the Christians. We appeal to the chief minister to kindly defer the date of announcement of the Pahari Minority Development Board." Those present at the meeting have decided to write to the chief minister requesting her to keep the declaration of the board "pending till further detailed studies are made by the communities concerned". The Christian community, which accounts for about 10 per cent of the hill population of 8.75 lakh, had never demanded a development board. 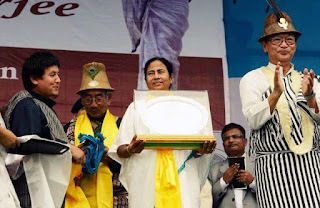 Till date, Mamata has formed 12 development boards but all of them are based on community and not religious lines. Communities such as Lepchas, Tamangs, Rais, Sherpas, Bhutias and others have boards. The Muslim population in the hills has been demanding a development board for the community since 2014. Arif Khan, the president of the Pahari Muslim Welfare Society based in Kurseong, is spearheading the demand. "We have been demanding a Pahari Muslim Development Board. Pahari Muslims were recognised as a backward class by the West Bengal government in 1999," he said.